Chile is an incredibly beautiful, diverse country, home to everything from the driest place on Earth to some of the most magnificent glaciers and wild landscapes you can imagine. To experience the best it has to offer, put these places on your itinerary. The granite pillars of Torres del Paine soar for more than 6,500 feet above the Patagonian landscape, dominating the scenery of what’s often referred to as South America’s finest national park, and it’s arguably one of the most spectacular in the world. For those willing to venture to Chile’s southernmost region, you’ll find some of the most incredible scenic hiking opportunities with trails that meander through emerald forests, passing turquoise-hued lakes, roaring rivers, and even a brilliant, blue glacier. The park is also home to flocks of ostrich-like rhea, Andean condor and flamingo. Guanacos, a relative of the camel, were almost hunted to extinction, but after a decade of effective protection, the large and increasingly growing herds in the area no longer even flinch when a vehicle or human approaches. 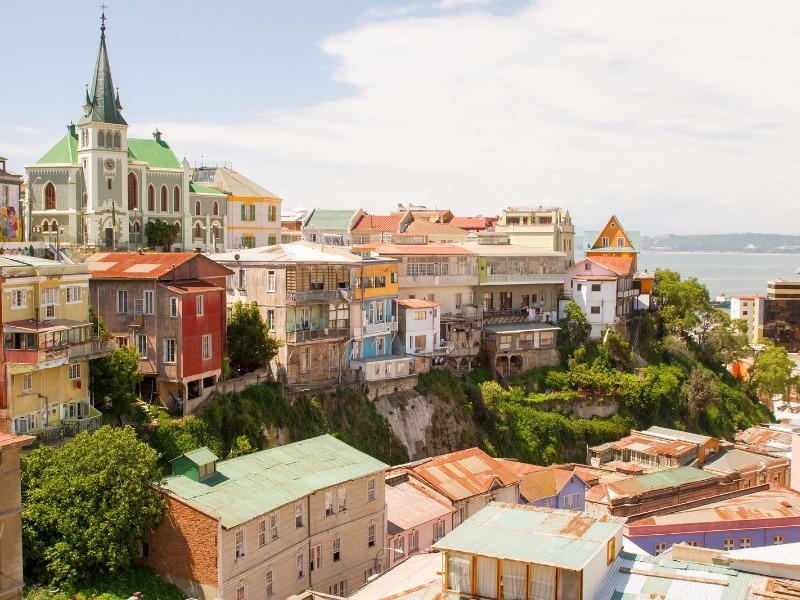 The colorful ramshackle streets of Valparaíso are a walking tour unlike any other. While it may not be as popular as Santiago, magnificent Victorians and tin-walled buildings hug the steep hillsides, while walkways meander around the slopes as rickety funiculars wait to bring visitors to hilltops. There are Bohemian neighborhoods to explore, 19th-century mansions to gaze at and a happening art scene the includes the impeccably restored landmark Palacio Baburizza, the Museo de Bellas Artes, showcasing European and Chilean artists. There are also lots of gourmet restaurants serving fine cuisine paired with great wines, much of it produced locally, and a buzzing nightlife too. 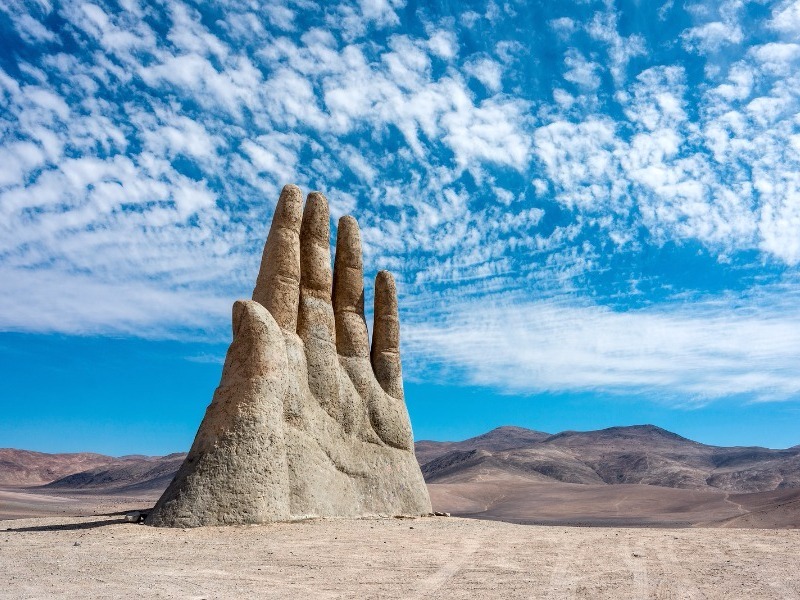 One of the driest places on Earth, the Atacama Desert is so harsh that humans are unable to inhabit it permanently, though the extremely harsh climate is what draws so many scientists and adventurers who are fascinated with this very unique destination. Astronomers come for its almost always cloud-free skies, with the dry air resulting in few distortions from atmosphere vapors. As such, there are a few observatories here like ALMA, the world’s largest radio telescope. The best way to explore it is with a local tour company or an all-inclusive hotel that offers tours, like Tierra Atacama and Explora. Some of the options include visiting Calle de la Luna, the “Valley of the Moon” where massive sand dunes and stone formations mimic the moon’s surface, driving across a salt lake and watching gushing geysers. Atacama is also one of the best places on the planet to watch the sun go down, with low light heightening the textures and deepening the fiery red, yellow, green and even blue shades. One of the world’s greatest unsolved mysteries revolves around the famous statues on this remote island located some 2,300 miles from the coast of Chile. 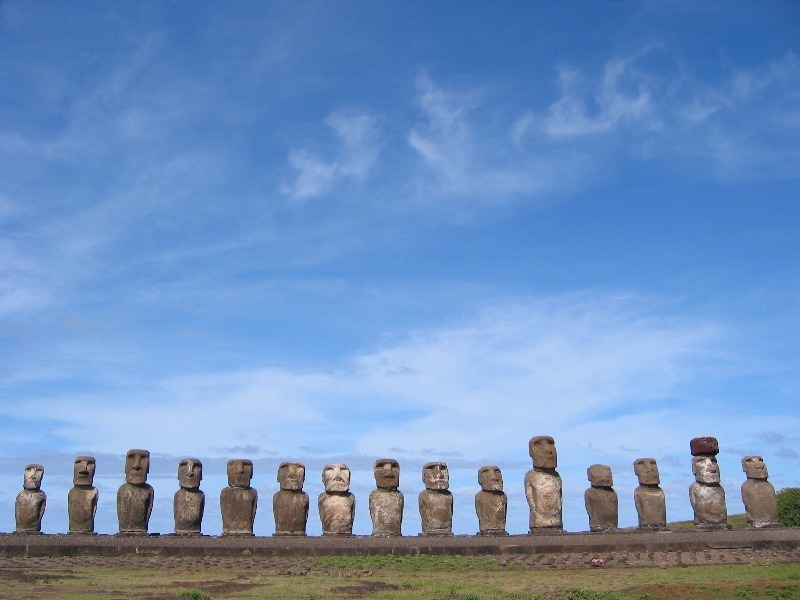 The Rapa Nui who once lived here were believed to have built the 887 giant Moai rock statues, the lightest weighing 86 tons. How they were able to move them around from platform to platform around the island is still anyone’s guess. By coming here, you can come up with your own theory – were they placed by aliens from another planet? While they’re likely to remain a mystery, the statues serve as the only link to the demise of this isolated Polynesian culture. In addition to admiring the Moai and delving into their mysteries, you can also enjoy soaking up the tropical sun on one of two white sand beaches, snorkeling and diving in indigo-hued waters, traditional surfing and body surfing. 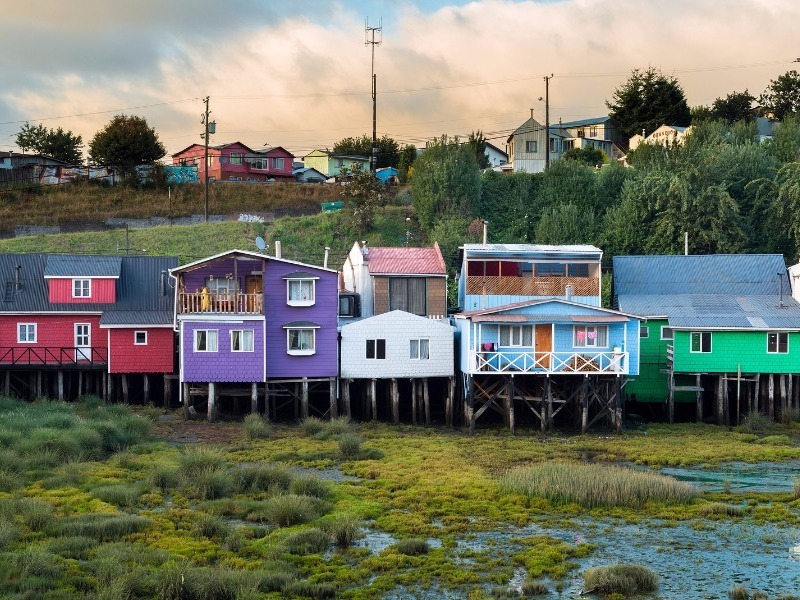 Chiloe is the largest island in the 41-island archipelago of the same name. A popular escape for Chileans, it’s becoming an increasingly popular destination for outsiders too, with its historic wooden churches, stilted houses finely-crafted woolen sweaters and unique and tasty gastronomy like rich seafood stews. It’s also loaded with gorgeous natural scenery, from dense temperate forests to beautiful wild beaches. Just some of the activity options here include whale watching, bird watching, kayaking, hiking and horseback riding. The island character and its seafaring people draw many here too, with an interesting spiritual culture that is based on a distinctive mythology of witchcraft, ghost ships and forest gnomes. The Los Pingüinos Natural Monument is home to more than 120,000 Magellanic penguins, one of the largest penguin colonies and most important penguin breeding sites in southern Chile. 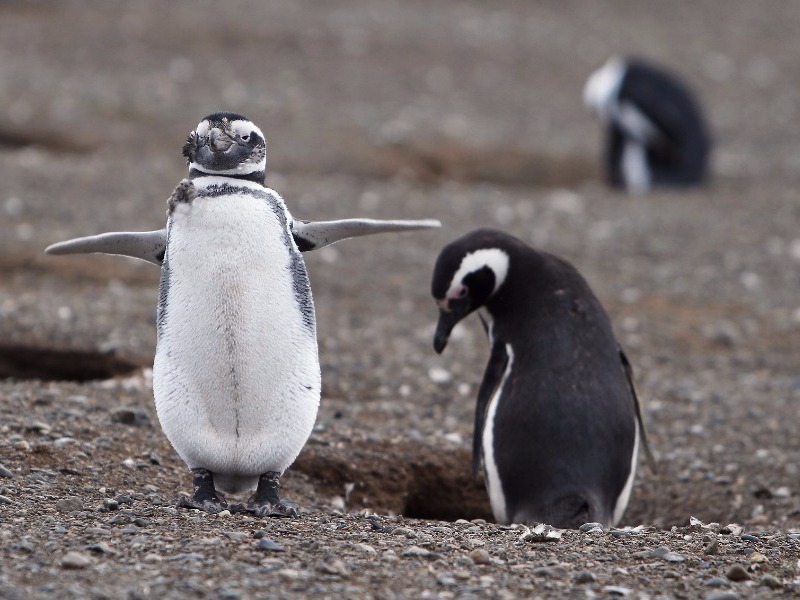 It’s one of the best places in the world to view the tuxedo-donning, flightless aquatic birds. Located on Magdalena Island, a less than one-square-mile isle topped with a picturesque red lighthouse, it lies about 22 miles north-east of Punta Arenas. In September or October every year, the adorable birds migrate back here to find their mate and stay through the end of March. Visitors can mingle with them, observing how they live in in their communities. There are other species to see too, like the sea lions, cormorants and seagulls. Located in the Andean range in Chile’s far north, Lauca National Park is one of the country’s most-visited tourist attractions. The high altitude (between 9,850 feet to over 20,000 feet at its highest point), not only leaves visitors breathless, so does the spectacular scenery of glistening lakes, including Lago Chungaro, one of the world’s highest lakes, and soaring volcanoes like the dormant Volcan Parinacota which rises over it with its snow-dusted cone. 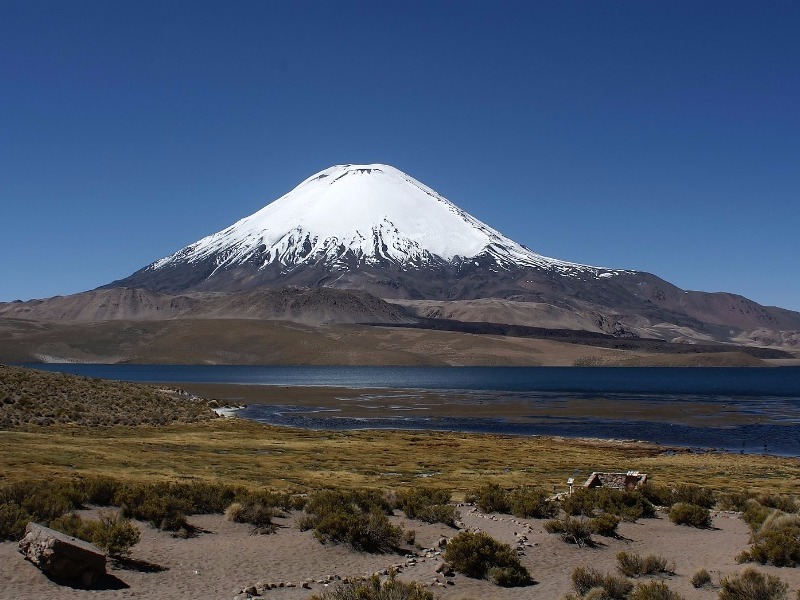 The mountain also shelters highland villages and an incredible variety of wildlife, including llamas, alpacas, guanacos, vicunas, vizcachas and cougars, along with an astounding number of bird species like the Andean goose, Chilean flamingo, the punaibis and the Andean condor. 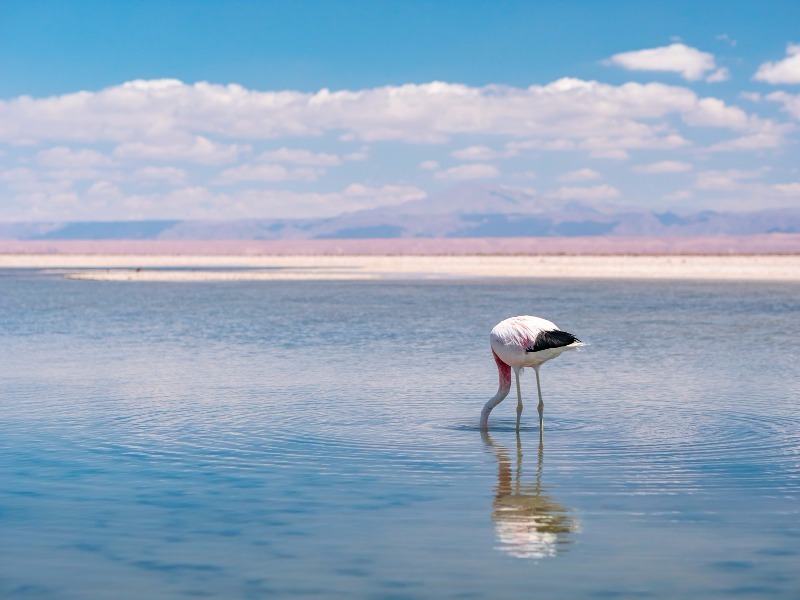 San Pedro de Atacama is a place that draws visitors from across the globe. A quaint haven in the world’s driest desert with dusty streets that are lined with adobe brick buildings, it’s a gateway to numerous attractions, many of which are part of the Los Flamencos National Reserve, like the Tara lagoon and salt flat, Zapaleri river, Aguas Calientes 1 Salt Flat, and Negra Lagoon. 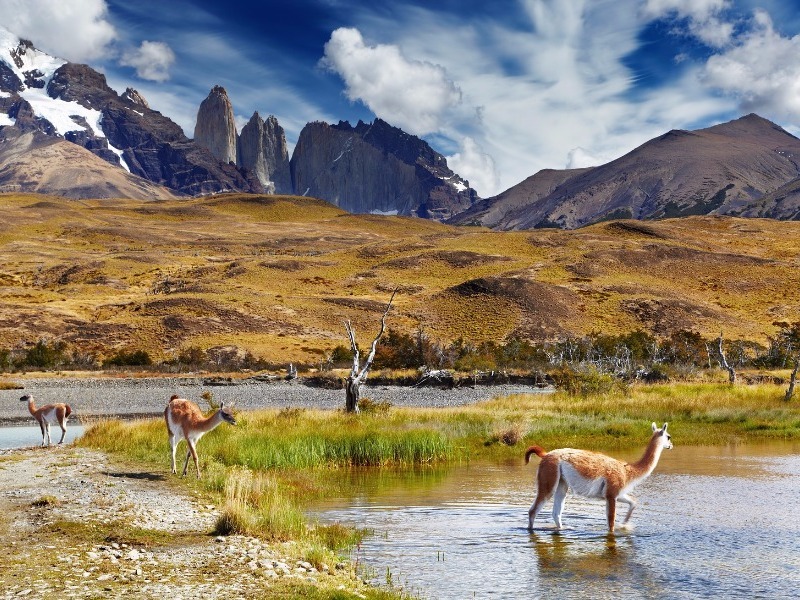 The animals that call this area home include the vicuña and the Andean fox. The town itself offers a host of rustic-chic hotels and a variety of restaurants, while New Age spirituality wafts throughout, and it’s all surrounded by a stunning landscape of hot springs, geysers, volcanoes and salt flats. Ringed by the snow-capped Andes and the Chilean coastal range, Santiago not only offers an especially dramatic setting between the Pacific and the Andes, it’s cleaner and statistically safer than its more popular South American neighbors, Rio de Janeiro, Brazil and Buenos Aires, Argentina. Art lovers can find some of the best works simply by wandering the cobbled streets of the older barrios, though there are plenty of modern cultural centers too, particularly those at Estacion Mapocho and underneath Palacio de La Moneda. The cosmopolitan epicenter of Chile is also jam-packed with fine dining eateries, fascinating museums, suburban parks and happening nightlife spots, including the lively bars in the bohemian Barrio Bellavista. 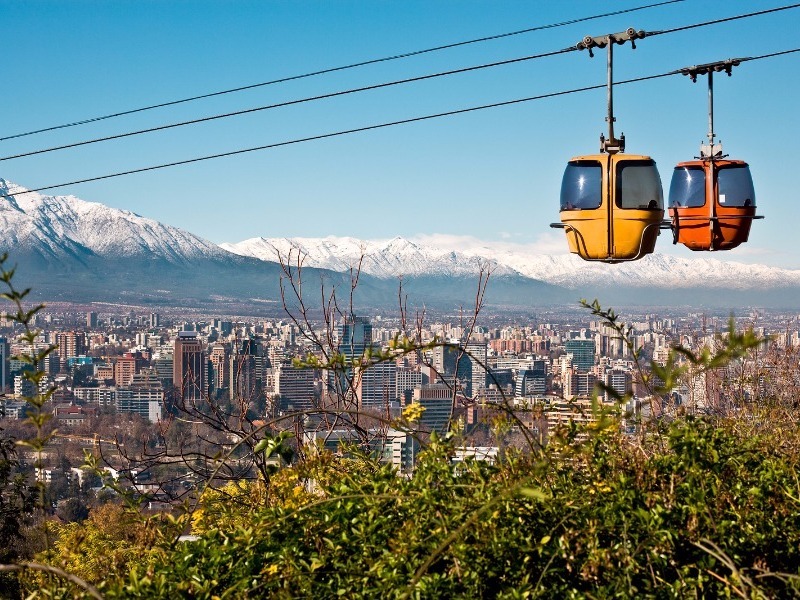 Santiago also makes an ideal base for hiking, climbing, skiing, sun worshiping and wine tasting too, with mountains, ski slopes and beach resorts all nearby.